Accepting the transfer from within the new account. The VPS mailservice configuration does remain intact in a handover, but its configured to use a username / password that is specific to the TransIP account. We recommend removing the VPS mailservice configuration prior to the handover, and that the new owner configures the VPS mailservice again after the handover is completed. The services above are not transfered because they are considered seperate services that may also be used on other VPSs. For transfering a Big Storage disk, consult this article. For transfering a HA-IP, consult this article. In the top right, click on 'Manage', followed by 'Handover'. Enter the TransIP account-name you wish to transfer the VPS to and select 'Handover'. 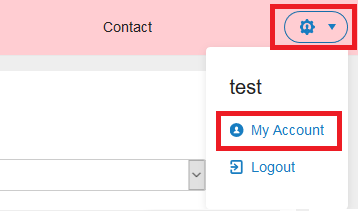 Log in to control panel of the receiving account and click the account-name of the account on the top right-side of the interface followed by 'My Account'. 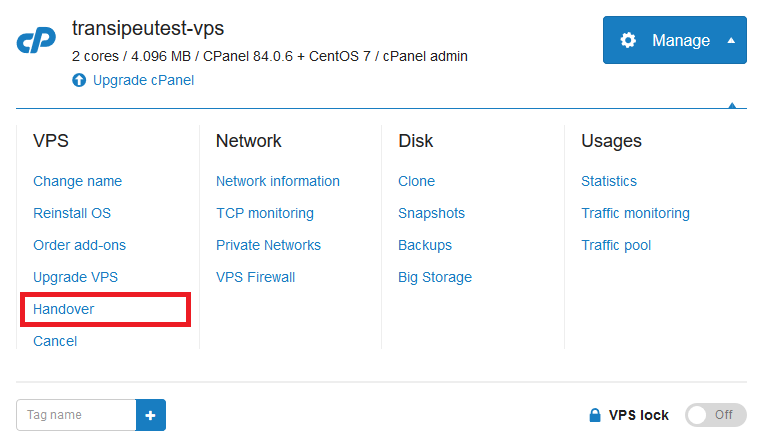 Select the H-number which lists the VPS that is being transferred. Click on 'Accept'. The transfer is now complete! Handovered VPSs will always be renamed to the name of the new account and will be briefly turned off to affect the changes. Keep this in mind and don't transfer your VPS when its in use.